Ben Caple is entering his 2nd season as Head Coach for the Hounds after serving the previous 4 seasons as Associate Head Coach. Caple replaced the 2015 Midwest Collegiate League Manager of the Year, Sean Osborne, just one season after winning the MCL crown. Osborne will still be involved with the DuPage Hounds organization as he is just moving into the front office full-time to take on business related activities as the team’s General Manager. Under the guidance of Osborne and Caple, the Hounds have compiled a handful of Midwest Collegiate League records over the last few seasons, including MCL's best win percentage as well as shattering the stolen bases record. As the Hounds enter their 6th season as an organization, more & more Hounds players are continuing their success into the professional ranks thanks to the help of Caple's blue collar, So-Cal approach. Caple received his Master's in Leadership Studies from North Central College in Naperville, IL in spring 2014. 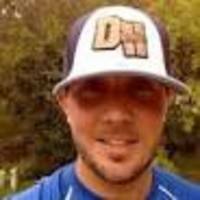 He currently resides in Tinley Park, IL where he is an independent baseball instructor, coach, and consultant for individuals & organizations across Chicago-land. Caple previously served as the infield/hitting coach at Benedictine University in Lisle, IL. His passion for coaching has stemmed from his former legendary coaches & mentors growing up. Caple grew up in San Diego where he was a 3-year letter winner at one of the nations most dominant programs, Rancho Bernardo High School. He was 1st team C.I.F. in Southern California his senior year as the Broncos finished with a top-five national ranking by Baseball America. Caple went on to play one year at Palomar CC in San Marcos, CA where was named 1st-team All Pacific Coast Conference his freshman year. The following fall, he was selected to play in the California Junior College All-Star game. Caple used a medical redshirt his sophomore year after tearing his hamstring early on in the spring, but still went on to play three seasons at Indiana State University under Head Coach, Lindsay Meggs. Throughout Caple's career, he has played in the same programs with numerous MLB and MiLB players. Some notable names include, Cole Hamels (Rancho Bernardo), Allan Dykestra (Rancho Bernardo), Bryce Harper (San Diego Show), Stephen Strasburg (San Diego Show & Sting), Micheal Leake (San Diego Sting), Jacob Petricka (Indiana State), Thomas Neal (San Diego Sting), Hank Blalock (Rancho Bernardo). Ben's brother, Tom, played for Augie Garrido at University of Texas & Rich Hill at University of San Diego. He then went on to play in the Boston Red Sox organization.